Thanks to 24K gold-plating, you'll receive a high-quality signal transfer so you can watch your shows in HD. Did you know that over 90% of today's top-rated TV shows can be watched for free? That includes live sports, news, the hottest sitcoms and more - all for free. With TV Free-Way™ Gold, you plug it into the back of your TV and start watching all of your favorite HD broadcast television shows. 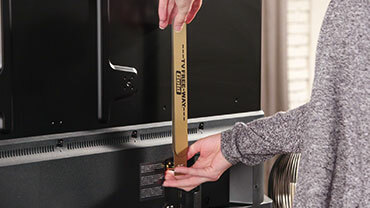 READ FULL DESCRIPTION TV Free-Way™ Gold uses premium 24K gold-plated connectors that give you high-quality signal transfer so you can watch all of the major channels - all in high definition - for free. There's no messy wires, no big ugly cable boxes, or unsightly satellite dishes on your roof. And best of all there are no monthly bills. That's right - no monthly bills. Use it anywhere you want, like on the big screen, in the bedroom, on your porch, or on your TV up to 30-miles out at sea. You can't do that with cable. TV Free-Way™ Gold lets you watch 95 of the top 100 rated TV shows. Enjoy comedies, dramas, movies, local news, and live sports. Simply plug TV Free-Way™ Gold in and play. All major broadcast TV is free! Now you can cut the cord and save over $1,000 per year the free way with TV Free-Way™ Gold. Get free TV forever now!